this map is by Gerard Mercator. 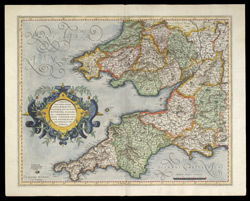 It covers the English counties of Cornwall, Devon, Somerset, Dorset, Wiltshire, Gloucestershire, Herefordshire, Worcestershire and the Welsh counties of Glamorgan, Monmouthshire, Carmarthenshire, Penbrokeshire, Cardigan and Radnor. It dates from 1595 and was published in Duisburg by Rumold Mercator, Gerard's son. Gerard Mercator was one of the greatest map makers ever known. He started his career as a professional instrument maker after finishing a masters degree at Louvain University and studying advanced mathematics. By the 1560’s he was developing a new form of navigational projection.